When Chloe Woodruff won two national titles at the National Mountain Bike Championships last summer, it was a defining moment for her. Chloe has been working her way up through the ranks of America’s top female riders for some 10 years now. She actually started racing in the pro ranks in 2006 when she was in college. 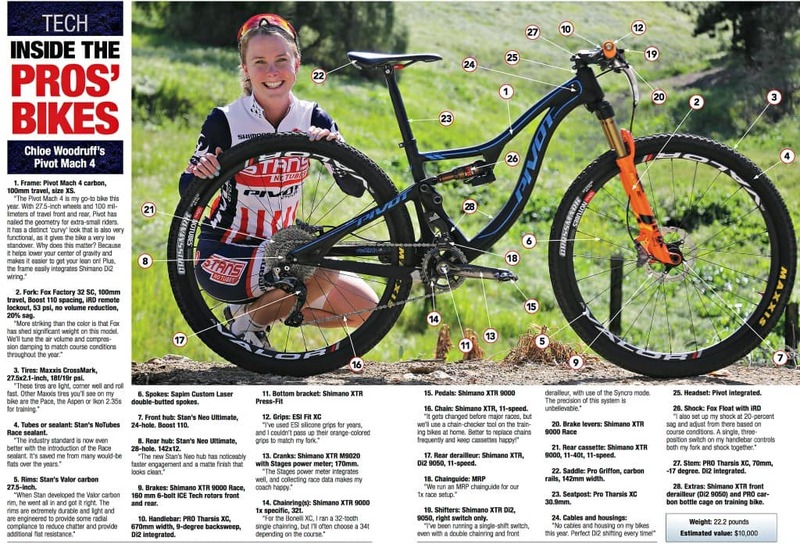 When she won the Pro Women’s Cross-Country title last summer at Mammoth Mountain, California, it was the first time she had ever won a national mountain bike title in the pro ranks. To follow it up, Chloe won the USA Cycling Pro Women’s Short-Track title the very next day. With that accomplishment, there was no longer any doubt about her status. Chloe had officially joined the top ranks of America’s best racers. It also made her one of our best bets to earn a slot on the U.S. Olympic team this summer. We met up with Chloe recently to learn more about her and her bike of choice this year. Killing it: Chloe puts the hurt on Larissa Connors at Bonelli Park. MBA: Where did you grow up? Chloe: Boulder, Colorado. Chloe: My dad’s an artist and my mom’s an architect. Chloe: I was too young to remember. Chloe: My dad, so I’m told. MBA: If you raced other kinds of bikes before mountain bikes, when did you do that, and how well did you do? Chloe: I came close to winning the Collegiate Road Nationals once (but I didn’t). Chloe: I’m pretty sure all my early bikes were mountain bikes, but I didn’t get a “real” mountain bike with suspension until middle school. Chloe: My first race was the 2002 24 Hours in Moab, and I was on a Junior Women’s relay team. Chloe: We won the relay. Chloe: Two-time Junior X (Cat 1, 17–18) National champion (2004 & 2005); Expert Short-Track National champion (2005); Junior Pan-Am champion (2005); U23 Pan-Am champion (2006); Collegiate District 1 XC National champion (2006, 2007, 2009); Collegiate District 1 STXC National champion (2006, 2007); and U23 National champion (2007, 2008). Chloe: 2015 XC & STXC National champion; 2015 WORS Cup Pro XCT win; five Pro Short-Track wins; Whiskey Off-Road win (2014, 2015); Grand Junction Off-Road win (2014); 2015 Pan-Am bronze medal. MBA: What did you study in college? Chloe: I earned a B.S. in community health education from the University of Arizona. MBA: Did you win any awards there? Chloe: Basketball was my life from sixth through ninth grade, but I never grew. One time I finished a sprint triathlon in Tucson (simply making it out of the pool was a small victory). And, I enjoy Turkey Trot 5Ks, where I inevitably end up getting beaten by 9-year-olds. MBA: What can you tell us about growing up in your family? Chloe: We traveled a ton, usually in a car and out west. Trips with my dad often involved visiting dams and mines—altered landscapes which he photographed for paintings. The four of us and our dog also road-tripped in our ’85 VW Vanagon to Alaska. That trip took two months and involved more than a couple breakdowns. Traveling with my family was often spontaneous and not what most people would consider a “vacation,” but it taught me to appreciate each opportunity to see some- place new—and racing mountain bikes keeps those opportunities coming. Chloe: I won my first UCI cyclocross race four years before I won my UCI mountain bike race.